The extra depth of this storage container allows for storage and organization of larger, bulkier supplies. Use open core or customize up to eight compartments for multiple storage options. Fits inside super satchel cube (6855SC). accommodates serge thread tray (6901AB), paint tray (6828AG) and marker tray (6939AB). all boxes in the super satchel Series are molded in acid-free plastic. All inch standard depth", "slim" and inch double deep" models are stackable. Ideal for organizing and storing art and crafts supplies, small toys, doll accessories, building blocks and Trading card collections. 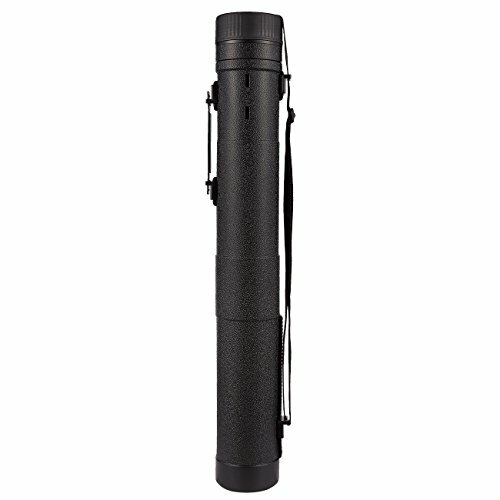 Made in the U. S. A.
Telescoping and locking feature extends from 30.5 inches to 49 inches in length. Easily Unclip the top for maximum extension! Use "open core" (without dividers) for paper, vinyl sheets, albums and fabric or customize up to 8 compartments for multiple storage options including photo storage, card making supplies, dies, templates, punches, fat quarters, vinyl rolls and more. Extra depth allows for storage of larger, bulkier supplies. Area on dividers accommodates standard size address labels to ID contents of each section. Fits in the Super Satchel Cube (6855SC). 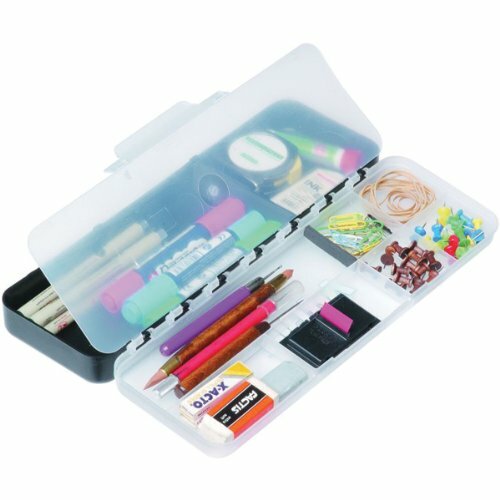 This roomy 17 inch plastic art and craft supply box features a lift-out tray for smaller supplies such as paint brushes, pens, pencils, Cutting tools. The two quick access in-lid storage compartments are perfect for often used items. 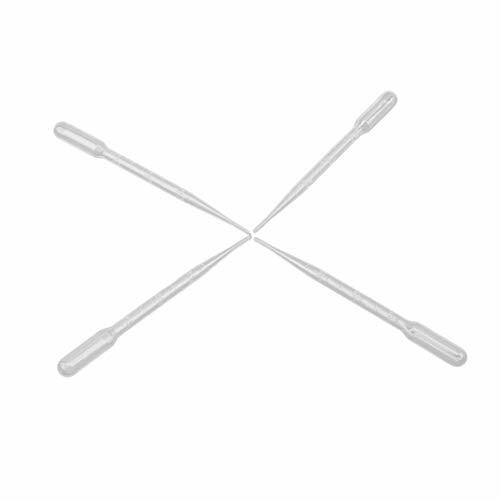 The rubber over-molded handle is designed for comfort and durability. The sturdy lockable latch keeps your supplies safe and secure. 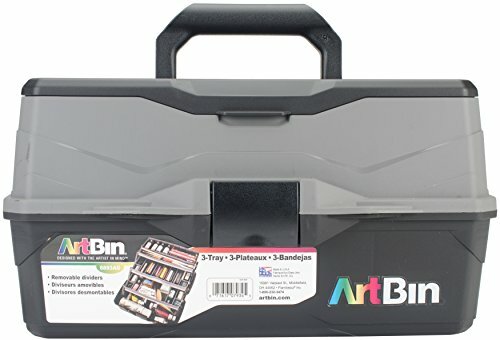 This art supply box is perfectly sized for both the student and professional artist. The 17 inch twin top can also be used as a craft supply storage box, sewing box and paper crafting box. The classic version of the traditional artist's tool box. Protect, organize and transport your pencils, erasers, artist tools and supplies. 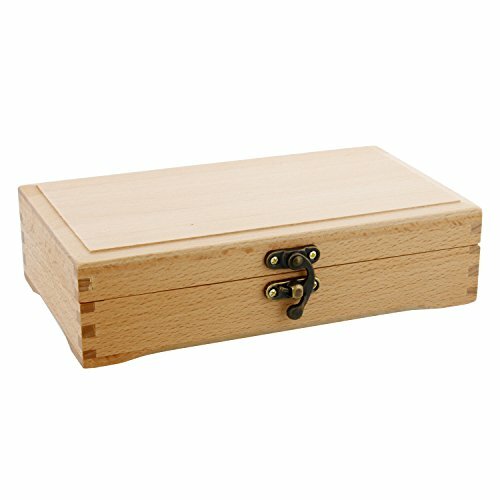 An elegant, unfinished wood box is constructed of Beechwood. It is light-weight yet sturdy, and it features quality hardware. 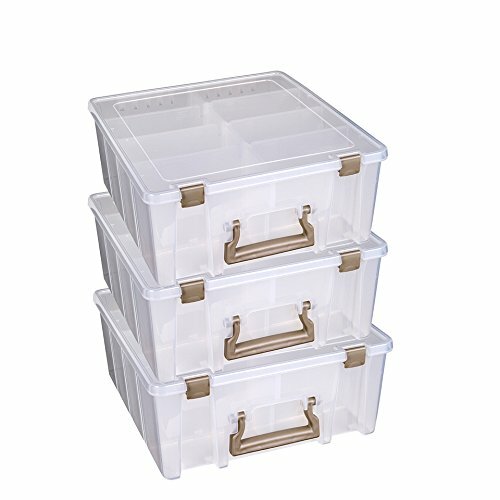 When you're searching for a practical and functional storage solution for small parts, bits and bobbles or even a prized collection, we have the answer! Our clever fishing gear tool box organizer features 3 levels of storage space to keep things tidy and neat. It's a handsome fishing accessories tackle box that's downright efficient and effective at holding all your fishing supplies in a case that's not too big and not too small. It'll be easy to grab from your trunk or truck bed and carry right on down to the river. Every home needs a basic toolbox for holding necessities like a hammer, wrenches, tape measure and utility knife. Fill it up then tuck it away on a garage shelf, under the sink or in the closet. Move your tools from your junk drawer to this handy toolbox and always be able to get what you need when you need it. 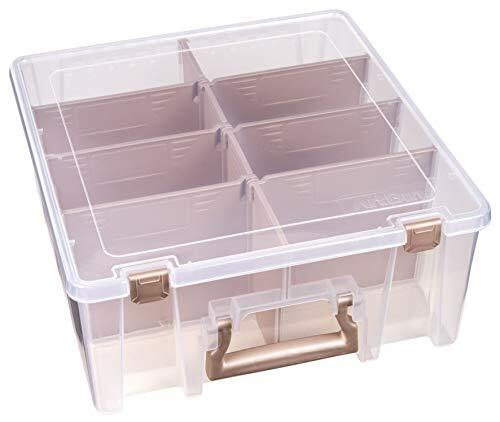 Not just for tools and tackle, this box is a multi-purpose organizer! 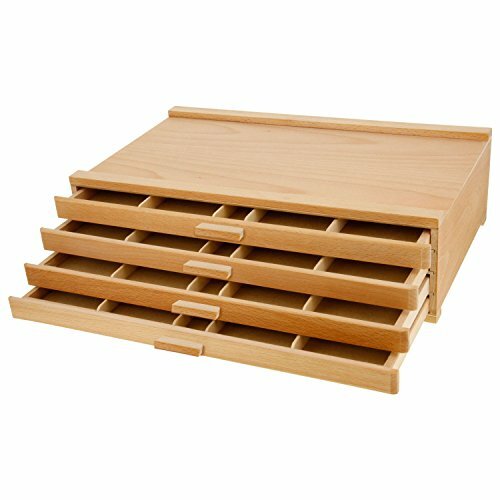 Use it for storing arts and crafts supplies, small toys, collections, cosmetics and more! We can tell you from experience that you'll have a hard time deciding how to use your first one, so you may as well buy 2 or 3 now. Set up a first aid kit in the car with a flashlight, bandages and flares. Then, use another for small parts and pieces from your hobby. 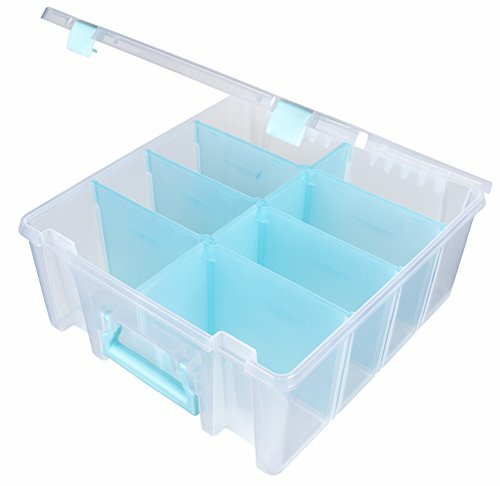 Buy your storage bin box with pull out trays today! We know you'll be impressed with the quality and glad you made the purchase. 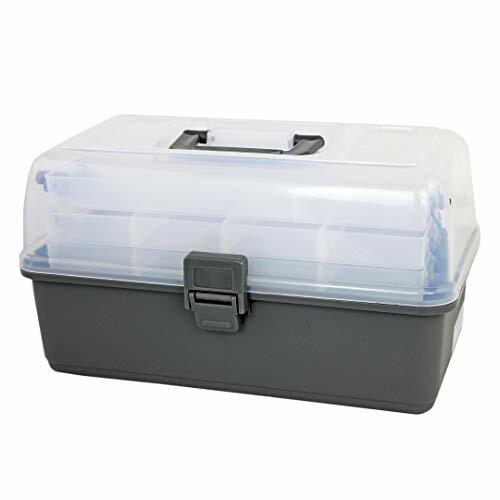 STORE FISHING SUPPLIES - Keep your lures, hooks, line, bobbers and sinkers all in a handy bait and tackle box that's easy to carry. Easily stow it on your boat or truck and be ready to fish anytime. Perfect for bass fishing, trout fishing or organization and storage of your fishing lure. 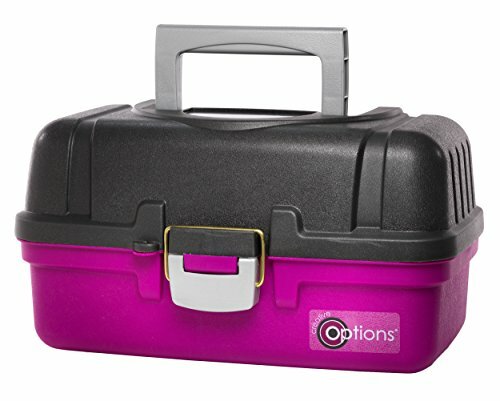 BUILD A SMALL TOOLBOX - In a convenient size that's great for tackling small jobs, this storage box will easily hold your hammer, pliers and screwdrivers, along with an assortment of nails and screws. 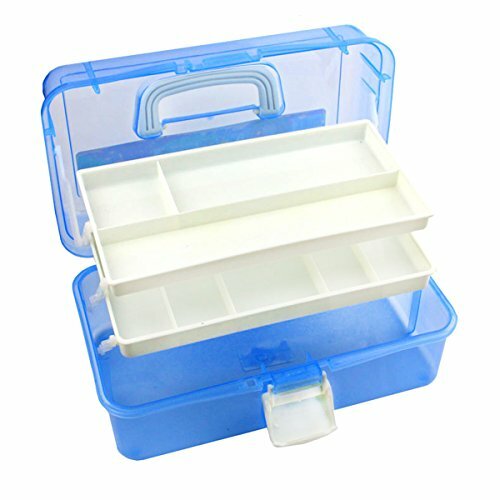 MAKES A GREAT TACKLEBOX FOR KIDS: It's the perfect size for little hands of young boys and girls. Make them feel special with their own supply box filled with their favorite colorful worms, lures, hooks and casting sinker weights, fishing swivels snaps, sinker slides, and fishing line beads. ORGANIZING MADE SIMPLE: With three pull out trays, you'll have many nooks and crannies for stashing small and tiny items. Two trays include removable dividers for you to create perfectly sized spaces. SIMPLY GRAB AND GO: The travel size storage box measures 14.25W, 8H and 7.5D. Take it on road trips as your toiletry and makeup organizer or when you're camping to hold clothespins, matches, etc. 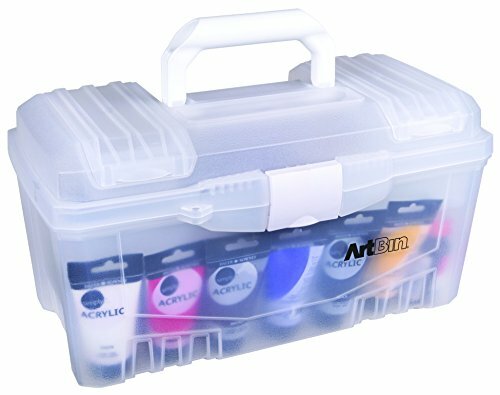 Protect, organize and transport your paints, brushes, tools and supplies. 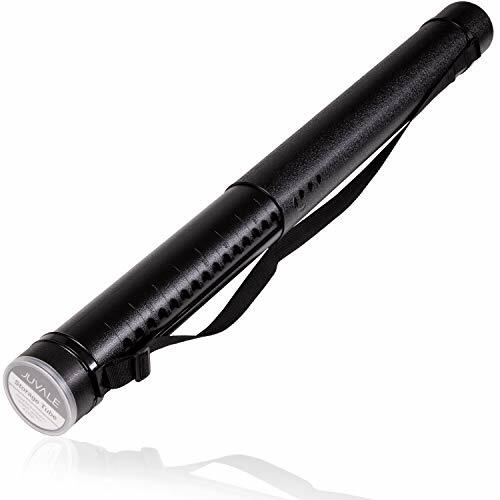 It is light-weight yet sturdy, and it features metal hardware and a durable handle. Eight separate, removable storage dividers provide versatile organization. This Artist's Supply Chest features 2 locking clasps to keep supplies secure. Designed for easy portability with a durable leather handle. It is light-weight yet sturdy, and it features a durable handle. 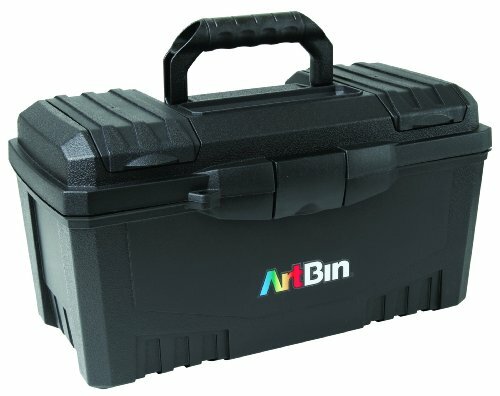 The classic version of the traditional artist's tool box with multi-functional compartments. 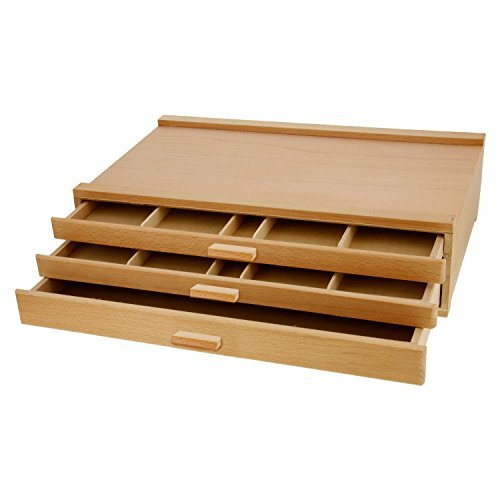 Two top brush storage slide open trays for easy access to supplies and brushes. It is light-weight yet sturdy, and it features s full size pull out drawer. The extra depth of this storage container allows for storage and organization of larger, bulkier supplies. Use open core or customize up to eight compartments for multiple storage options. Fits inside Super Satchel Cube (6855SC). Accommodates Serger Thread Tray (6901AB), Paint Tray (6828AG) and Marker Tray (6939AB). All boxes in the Super Satchel Series are molded in ACID-FREE plastic. All "Standard Depth", "Slim" and "Double Deep" models are stackable. Ideal for organizing and storing art and crafts supplies, small toys, doll accessories, building blocks and trading card collections. Made in the U.S.A.
Use open core (without dividers) for paper, vinyl sheets, albums and fabric or customize up to 8 compartments for multiple storage options including photo storage, card making supplies, dies, templates, punches, fat quarters, vinyl rolls and more. 3 Individual drawers have five separate compartments. The 3 pack of the popular super satchel double deep! The extra depth of this storage container allows for storage and organization of larger, bulkier supplies. Use open core or customize up to eight compartments for multiple storage options. Fits inside Super Satchel Cube (6855SC). Accommodates Serger Thread Tray (6901AB), Paint Tray (6828AG) and Marker Tray (6939AB). All boxes in the Super Satchel Series are molded in ACID-FREE plastic. All "Standard Depth", "Slim" and "Double Deep" models are stackable. 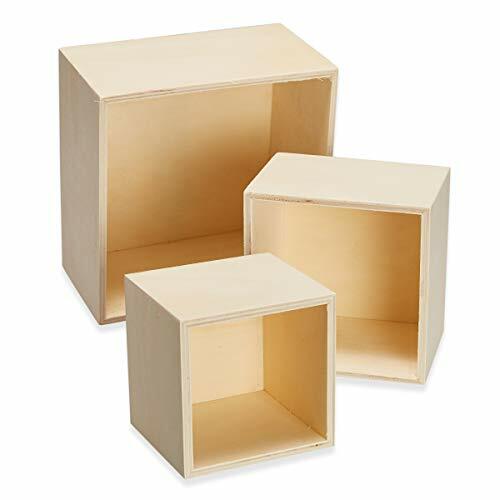 Ideal for organizing and storing art and crafts supplies, small toys, doll accessories, building blocks and trading card collections. Made in the U.S.A.
Art bin-sketch Pac. 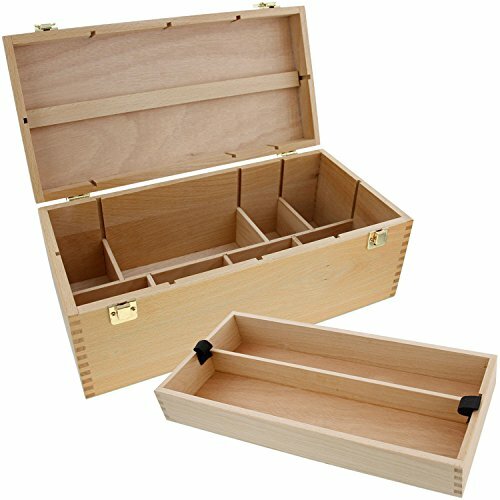 This storage case features a total of nine individual compartments for holding a variety of art tools and supplies. Two compartments are in the base of the box while the other seven are in the lid section. A central divider panel keeps the items in the top securely contained--simply release the tabbed closure to gain access. Overall dimensions are 12-1/4x4-1/2x1-3/4 inches. This package contains one sketch Pac. Made in usa. 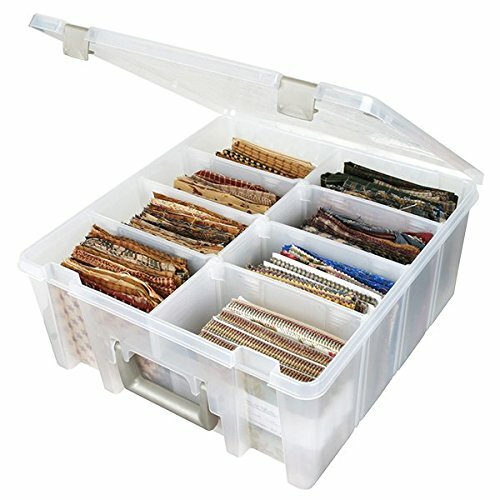 Tosnail 12-inch Plastic Craft Box keep your paint, craft supplies, fishing tackle, sewing notions and more organized portable and easy to access. 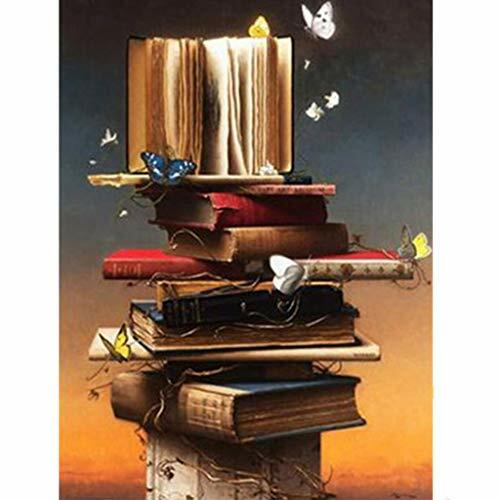 Made of high quality PP plastic material. The sticker on the top has been completely removed. 12-Inch storage box features 2 cantilever trays inside plus a bulk bottom bin. Clear plastic design with white carrying handle on lid and a snap tight clasp. Inner Size: 12" L x 6.5" W x 3.1" H; Refer to the pictures. PLEASE CONTACT US IF THE PRODUCT IS DAMAGED. 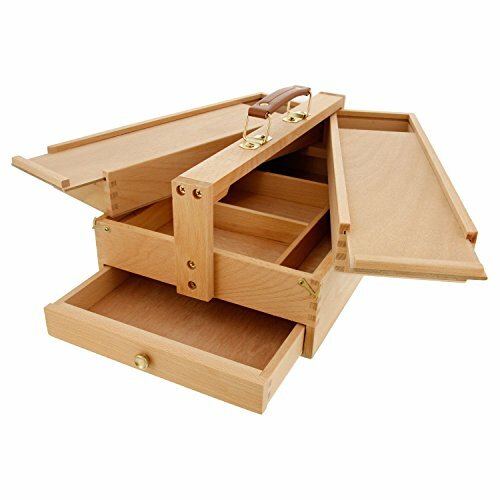 The Two-Tray Craft Box by Creative Options is the ultimate organizer for any craft artist. The toolbox opens to expose 2 expandable flowing trays. 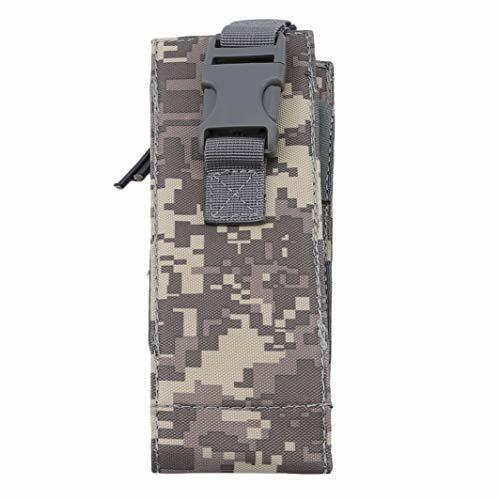 Each features long, rectangular, customizable, compartments that are perfect for holding paint tubes, brushes, pencils, thread, or any other small crafting items. The bottom is open for the larger craft items needed to complete your storage kit. They are applicable to shoes. 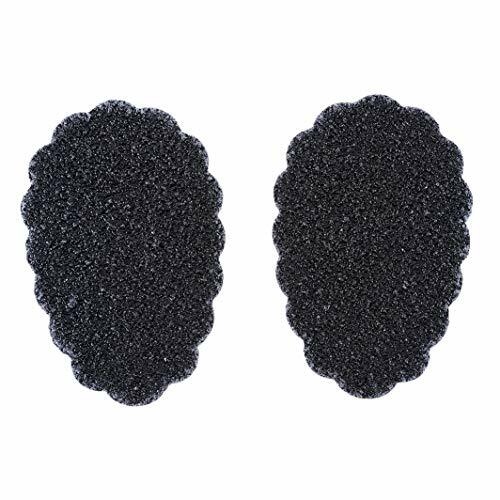 Easy to install, just peel off the backing paper, place the adhesive pad on the sole and press firmly. Please clean your shoe sole Before using. It's a sweet gifts for your friends and family. It can be used to hold the water bottle,very PORTABLE. Perfect for outdoor activities like traveling hiking boating jogging climbing etc. Durability,great material water bottle holder. This cute and attractive appearance can conform to the aesthetic of the child. Cute car design and candy color perfect for boy and girls. Durable and comfortable to carry. This eyeglasses case it is easy to open and close. Soft, clear plastic and easy to use. Used for transferring liquids for aromatherapy , measuring essential oils. Help you create the renewed and fashionable bathroom you desire. 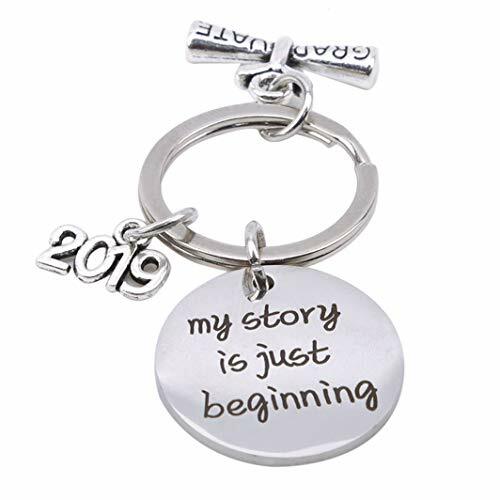 The beauty and elegance of the cute keychain make it the perfect accessory. Welcome to visit out store!We will give you the best service to you! 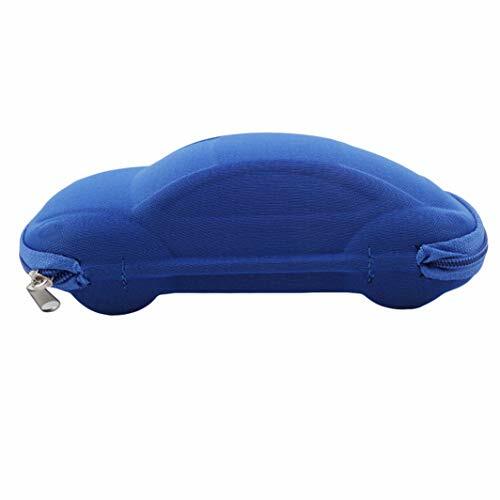 Very comfortable Fabric,it is a good gift for your lovers,friends and coworkers. 1.Different computer have different monitor,the color may be a little difference. MATERIAL: Made of environmentally-friendly high quality Oxford fabric material. Dirt-resistant easy to clean, durable waterproof polyester lining, can maintain food temperature. 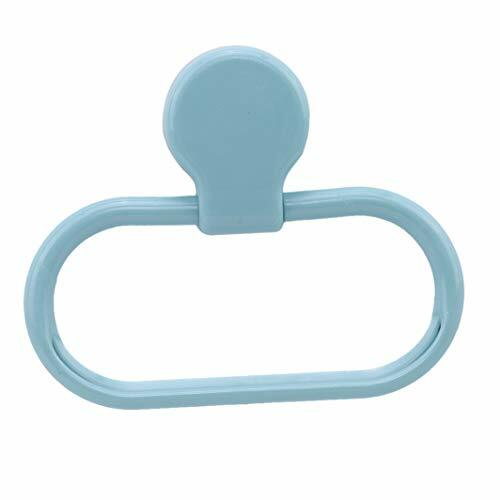 High quality metal zippers will not easy break, thick handle reduce weight hurting will make you carry it more conveniently. Size: 21*10*17.5cm;Waterproof Damp-proof lunch Bag: Equipped with eco-friendly waterproof polyester lining that is soft, leak-proof, and insulated, lady lunch bag excel in keeping your beverages cold or keeping your lunch warm. 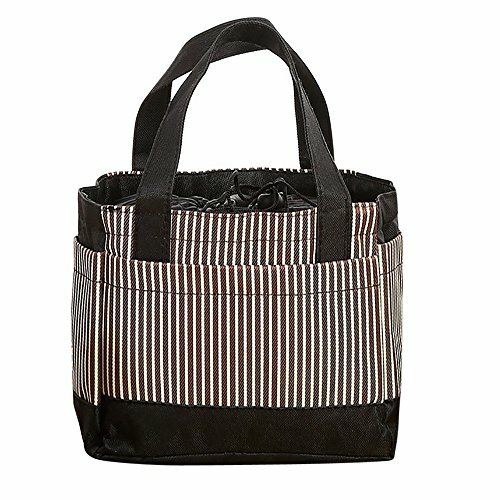 Spacious lunch tote can easily fit all your snacks, drinks, sandwiches, fruit or vegetable, you can take it with to the office, or pack a healthy snack for your children or have a delightful Sunday picnic. LUNCH BAG-Quality life starts with simple stylish design.This lunch bag can be used as lunch bag, picnic bag, sundry bag, suitable for all groups,include men,women,girls,boys and kids. This lunch bag looks small but with large capacity, it could perfectly fit your lunch box, snacks, and even protein shake bottle.This is the honest feedback from our customers.